Hesperaloe parviflora is a handsome architectural plant, as effective singly in large pots as in mass plantings geometrically arranged in the ground. 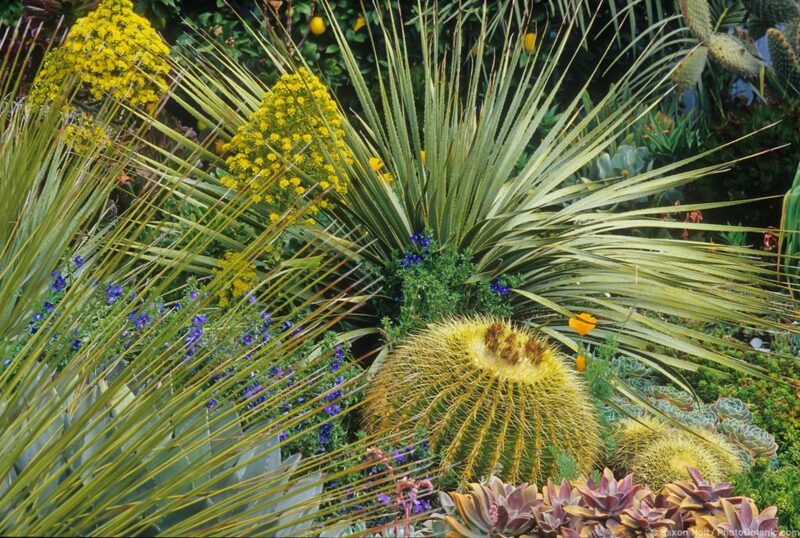 It is equally pleasing in a naturalistic mixture of succulents, grasses, or other dry-garden plants. 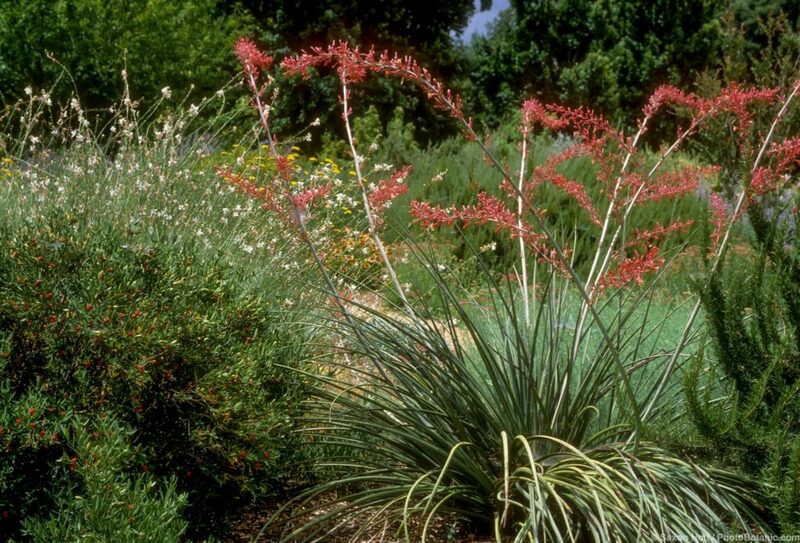 An evergreen plant with long, narrow, gracefully arching foliage, hesperaloe grows three to four feet tall and spreads six or more feet wide by rosettes so closely spaced that they seem to be part of the same plant. The leathery dark green leaves are spineless with distinctive white threadlike fibers along the margins. Sprays of pink or pinkish coral summer flowers on tall stalks open in succession from the bottom up, stunning combined with the large, round, bluish gray-green fruits. Hummingbirds compete aggressively for the flowers if the deer don’t get them first. I am not sure how much water hesperaloe truly requires or can tolerate. I grow mine in full sun in large containers filled with commercial cactus mix, where they seem to appreciate watering every week or so in high summer. In the ground they are said to need little to no supplemental water, but I cannot attest to that. Too much or too little water – or crowded roots as the potted plants expand – could explain the surprising lack of flowers on my plants after six successful blooming seasons. I watch every spring for emerging flower stalks, and in their seventh year they did not appear. I have taken the opportunity to divide the plants and repot in new soil. We shall see what next summer brings. There are other hesperaloes in the nursery trade. Hesperaloe tenuifolia, grassy hesperaloe, is smaller, three feet tall and wide, with even narrower leaves and white or pink-tinged white flowers. H. funifera, giant hesperaloe, is much larger, four to six feet tall and wide, with upright rather than arching foliage and creamy white or greenish white flowers on stalks ten feet tall. H. parviflora is sometimes offered as cultivars with yellow or red flowers. All hesperaloes are tough, clean, no-maintenance plants known for their tolerance of both heat and cold. 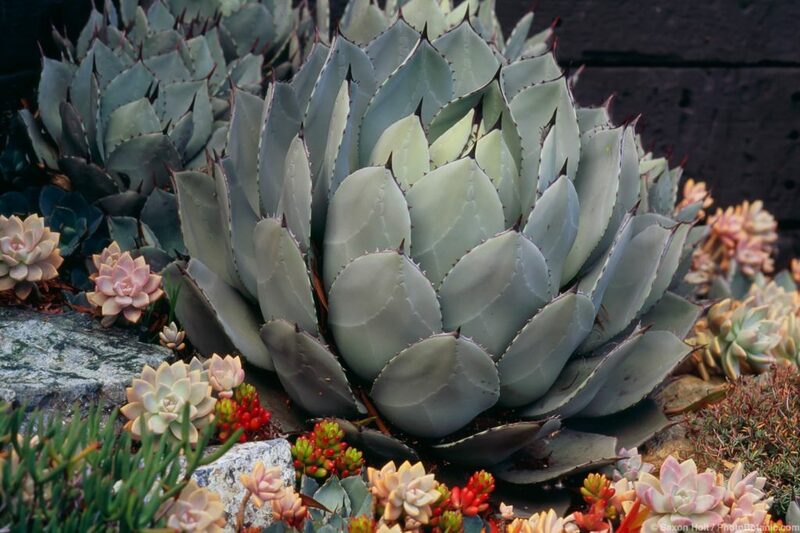 Agave parryi is quite variable, some forms or varieties an ethereal blue-gray, others a silvery gray-green, some with leaves that are broad and rather blunt on top, others with narrower and more elongated leaves. But all are elegantly symmetrical, and all bear leaves with distinctive dark brown to maroon to almost black marginal teeth and an equally dark, viciously sharp terminal spine. Agave parryi grows fairly slowly to about two to three feet tall and wide, and most spread by offshoots or “pups.” As the plant grows the leaves open from a tightly packed central core, and on the back of each leaf is the delicate tracery of overlapping leaves that spread out before it. Plants bloom only once and then die, reportedly after twenty years or so. Flowers are borne on a central stalk up to fifteen feet tall, and are vegetative magnets for hummingbirds. I grew this agave many years ago in southern California, where it flourished and multiplied, reliably sending out offshoots until a fairly sizable colony had formed. From this colony I recently brought a few north to the San Francisco Bay Area, a quite different climate, but one that seems to have satisfied this adaptable succulent, at least so far. Agave parryi is native to high deserts of Arizona, New Mexico, and northern Mexico, so it should not be bothered by even our most prolonged winter frosts. To help them withstand our sometimes drenching winter rains, I set them out in large, shallow pots in commercial “cactus mix” for fast drainage. Agave parryi is best planted where it will receive full sun a good portion of the day except in hot interior climates, where a bit of afternoon shade seems to be appreciated. This is a care-free plant, requiring no maintenance and little to no summer water once established. Plants will naturalize if given space and time. A boldly architectural plant for big drama in pots or in the ground, Dasylirion wheeleri (desert spoon or sotol) forms a dense, symmetrical rosette of long, narrow, silvery blue-green, somewhat twisted leaves with aggressively hooked teeth along the margins and attractively frayed straw-colored tips. Over time plants develop a short, stout trunk, which may not be noticed unless older brown leaves are removed. Native to northern Mexico and the southwestern United States, Dasylirion wheeleri is rather widely available in the trade. Several other dasylirions are available with a little hunting about, including D. texanum (Texas sotol), with paler green leaves that are not twisted, D. leiophyllum (smooth sotol), with glossy green leaves and, despite its common name, equally wicked spines, and D. longissimum (Mexican grass tree), with gray-green leaves that lack the fearsome spines and, after many years, a substantial tree-like trunk. Dasylirion wheeleri grows moderately fast, but can be held to a large container for quite some time. Mine were installed as decent sized five-gallon plants in thirty-six-gallon pots six or seven years ago. They are now six feet wide and four feet tall, spilling out in all directions. Because of the sharp spines, which catch and hold onto skin or clothing when they are so much as gently brushed or touched, all dasylirions except the smooth-margined Dasylirion longissimum are almost impossible to comfortably work around. They should be placed away from paths likely to be traveled by the unwary and spread far apart if more than one is planted in the ground. Pulling weeds, removing fallen tree leaves, or attempting to cut off dead leaves at the base are hellacious tasks, with outcomes ranging from snagged clothing to bloodied body parts. 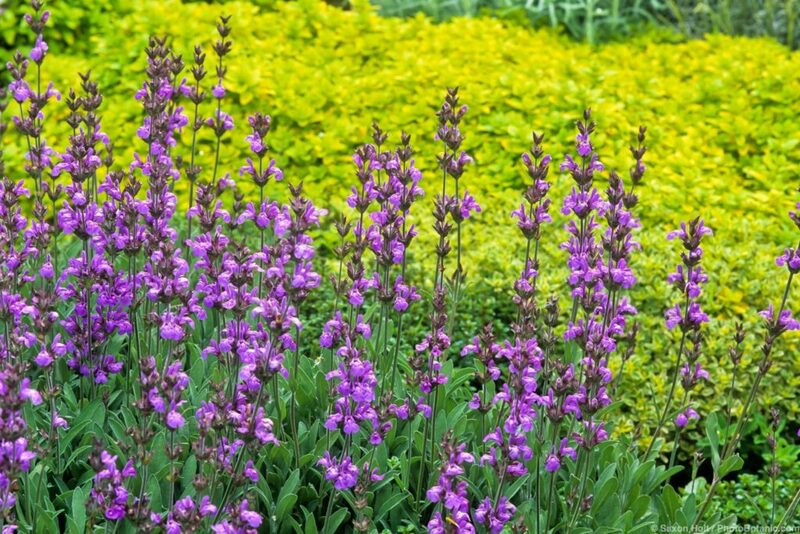 It’s best to locate these plants where no maintenance will be required. Dasylirions flower on spikes that arise from the center of the rosette, reaching ten feet or more above the foliage by early summer. Flower stalks appear only once every few years, but, unlike the agaves, the plants do not die after flowering. For some reason, my plants have yet to flower. Perhaps they are not sufficiently mature. Maybe it’s the afternoon shade (they are said to resent shade). Or possibly it’s the constraints of growing in containers. I can wait. Flowers are just a bonus on plants as spectacular as this. There are sages (Salvia) for almost any garden. Annuals, perennials, or shrubs; low and spreading to tall and upright; sun or shade loving; moist or dry soils or anywhere in between. If you are unsure what a particular sage needs, look it up or consult your nursery professional before adding it to your garden. One of the most reliable low-water sages for full sun is Cleveland sage (Salvia clevelandii), and one of the best varieties is ‘Winifred Gilman’. 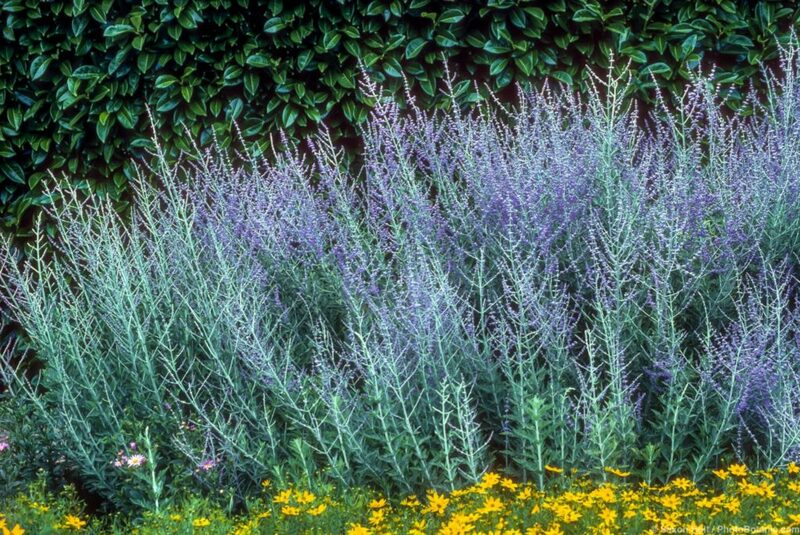 The spikes of bright lavender-blue to purple flowers in early summer are memorable, especially against the silvery gray aromatic leaves. Topping out at three or more feet tall and wide, Cleveland sage will thrive with little care for many years. Bees, butterflies, and hummingbirds love it and deer ignore it. Native to southern California, this sage needs good to excellent drainage and, in inland locations, seems to prefer, but doesn’t require, a deep soaking monthly in the hottest weeks of the year. 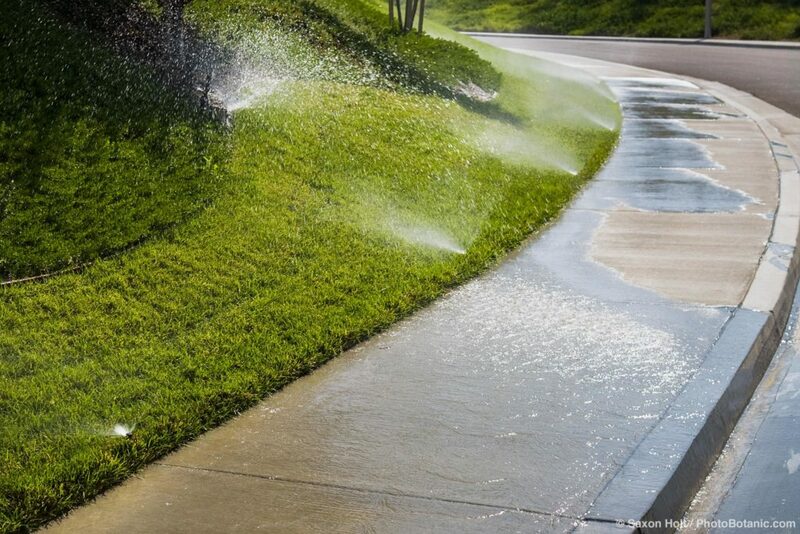 As with many summer-dry plants, a really dry winter or spring will result in loss or shriveling of leaves if no supplemental water is provided. But the plant probably won’t die – leaf drop is a drought response that conserves moisture. You can trim Cleveland sage back after flowering or take stems for arrangements during bloom, but don’t cut into old wood. 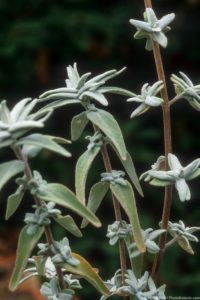 This sage, like many other shrubby perennials, responds well to frequent but gentle trimming as you would lavender or rosemary. There are many other beautiful sages for the summer-dry garden. 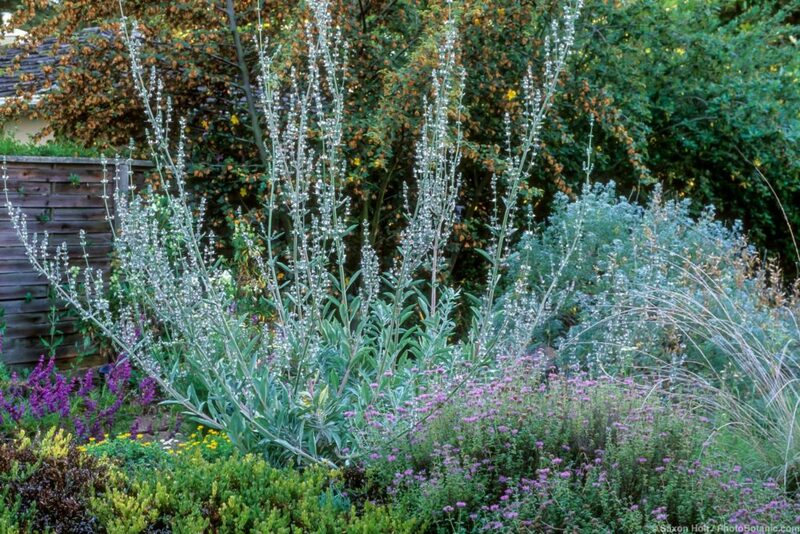 White sage, Salvia apiana, is four to five feet tall and wide with fragrant, woolly, almost white gray leaves and white flowers tinged with lavender in spring. Native to southern California and Baja California, it likes sun and good drainage and needs little to no summer water. In my garden it sheds many leaves in response to drought, but retains enough of its stunning white foliage to capture attention at any time of year. Purple sage (Salvia leucophylla) is a long-lived shrub three to five feet tall and wide with wrinkled, silvery gray leaves and pale purple flowers flowers in spring. Native to southern California, it thrives in full sun with no summer water once established. Sonoma sage (Salvia sonomensis) is a mat-forming creeping or trailing evergreen perennial a few inches to a foot tall and spreading three or more feet wide. Native to California in coastal mountains and Sierra foothills on dry slopes, in chaparral, or in open woodland, this lovely low sage prefers light shade and little or no summer water. Branches root as they travel across the ground and cascade nicely over walls, the softly textured gray-green aromatic leaves inviting touch. Spikes of medium blue to blue-violet flowers on leafless stems cover the plant from late spring into summer. Sonoma sage is one of those plants that simply won’t tolerate poor drainage, fertilizers, or more than the slightest summer irrigation. Give this sage a fast-draining spot on a slope or a mound of rocky soil and resist the urge to “help” it through the dry summer months. Old plants may get woody and bare in the center, but robust new growth and a slightly mounding habit give the overall effect of continuous cover in lightly tended further reaches of the garden. Other drought-tolerant shrubby sages include the long-blooming autumn sages (Salvia greggii), flowers usually red, but many other colors available, and Salvia muelleri (rich dark purple flowers). S. greggii is about three feet tall and wide; S. muelleri is usually somewhat smaller. Both have diminutive green leaves, very different from the larger gray and grayish white leaved sages. These sages look best with occasional deep watering in summer, though they will survive without it. Both can be cut back fairly hard to renew. Some afternoon shade is beneficial in the hottest locations. California coffeeberry (Frangula californica, formerly Rhamnus californica) is a handsome evergreen shrub with significant wildlife habitat value. Low and spreading to tall and upright, coffeeberry is an excellent candidate for the summer-dry garden. Coffeeberry can grow to ten feet tall or more and eight or more feet wide, but some varieties are only four to six feet tall and others are mounding groundcovers. All have substantial dark green to olive green leaves, gray-green beneath, inconspicuous greenish yellow flowers, and copious berries loved by birds and other wildlife. Berries turn from lime green to red to purplish black as they mature. Stems of new growth are reddish. Native to much of California and parts of the West, these are rugged, adaptable, attractive shrubs good for informal hedges or screens or as specimens. They look well groomed without pruning, but can be gently pruned to control size or shape. Give them sun to light shade or afternoon shade and reasonably good drainage. Coffeeberries do tend to be heavily browsed by deer in some locations and at some times of year, especially when newly planted. They require little to no water after establishment, although an occasional deep soaking is appreciated, especially inland. Named varieties are commonly available in nurseries and at native plant sales. ‘Eve Case’ is 6-8’ tall by 6-8’ wide, densely mounding with broad leaves and large berries, and seems to prefer coastal conditions. ‘Leatherleaf’ has large, dark green leaves and grows 5-8’ tall and wide. ‘Mound San Bruno’ makes a good large-scale groundcover, 3-6’ tall by 6-10’ wide, dense and compact with narrow green leaves. ‘Seaview’ is even lower, about 2-4’ tall and 6-8’ wide, with small dark green leaves and dense clusters of berries.